Mediaweek seems to think that El Portál is a city, rather than a shopping mall. Who knew South Gate would be the model for the rest of the country? According to Mediaweek, the future of urban life will be so-called "branded cities" i.e. neighborhoods built around advertising. 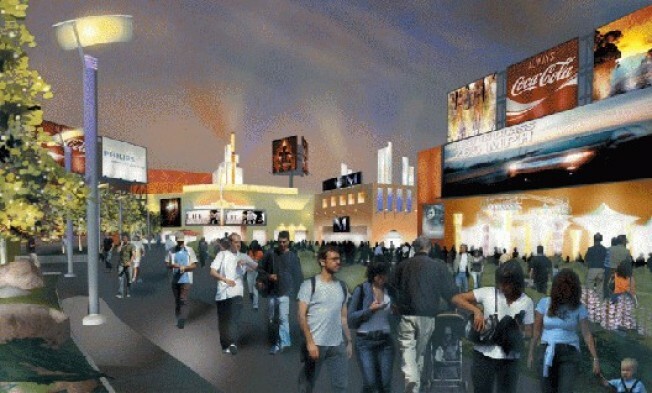 At El Portal, South Gate's $218.4 million, 498,880-square foot entertainment center planned for the intersection of Atlantic Avenue and Firestone Boulevard, shoppers (expected to be 90 percent Latino) will be targeted with ads via LED screens built into the development; in return, advertisers will collect information on shoppers. More via Mediaweek, which seems to think that El Portál is a city, rather than a shopping mall. No matter--advertisers are in a lather over this thing: "El Portál is the first branded city in the United States that is catering to a specific cultural group, Latinos... David Goldman, managing partner of Allied Retail Partners LLC, the real-estate development company behind the project." Pushing the "branded city" concept is the Outdoor Advertising Association of America, while advertising company Clear Channel Communications also has a Branded Cities division.